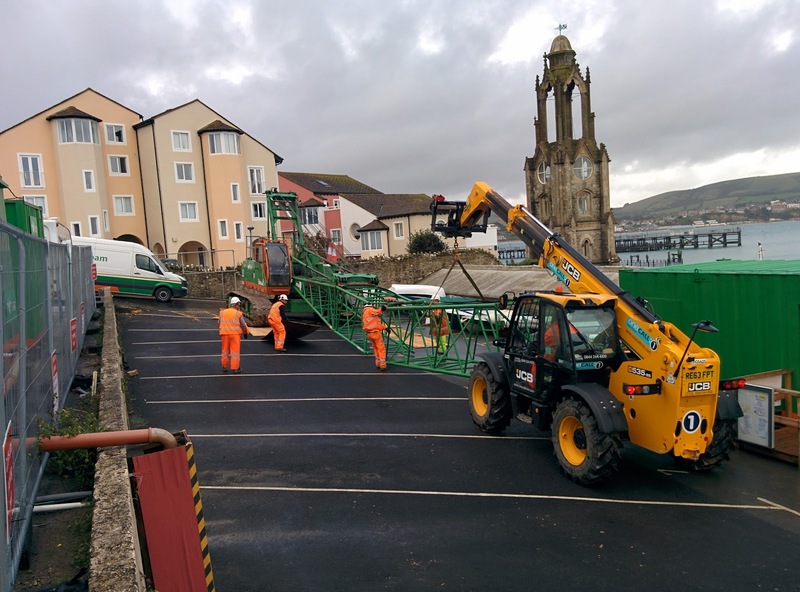 A fond farewell as Deputy 2nd Coxn John Gilmour leaves for pastures new. 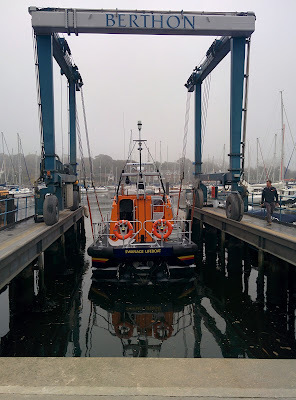 Yesterday was John Gilmour's last day as a volunteer at Swanage Lifeboat Station. 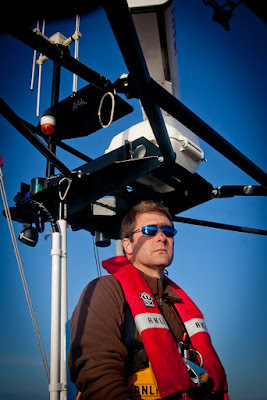 In a few days time he and his family will be moving to Scotland to start a new chapter in their lives. John is a teacher and has got himself a headship at Craigclowan Prepatory School. 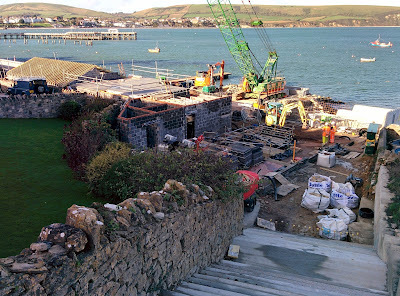 John joined us in January 2001 not long after moving to Swanage after getting a teaching job at The Old Malthouse School. 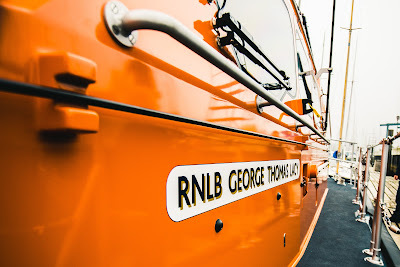 His experience in The Royal Naval soon became apparent and in early 2003 he was made an ILB Helmsman and a Navigator on the ALB. 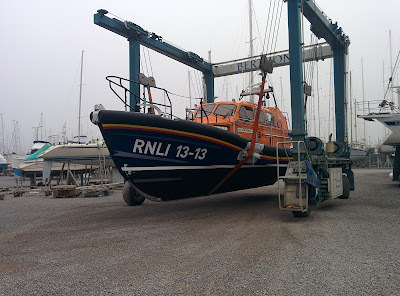 John is a keen sailor and he was often called upon to assist on board stricken yachts. In the summer of 2004 John was appointed as Deputy 2nd Coxswain for the station's all weather lifeboat. This would allow him to take command of the lifeboat in the Coxswain's absence. In his time at Swanage John has been on 50 services on the ILB and 150 on the ALB. This amounts to over 320 hours at sea. 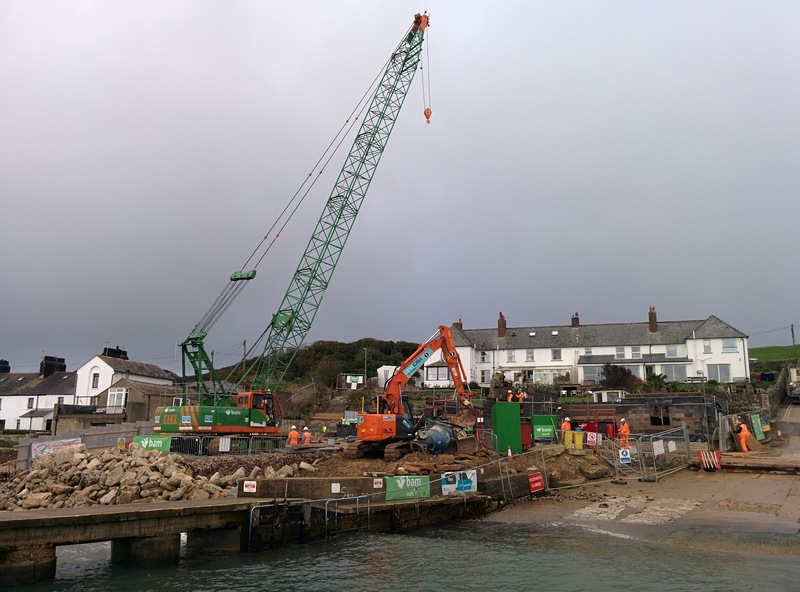 There are countless people who have benefited from John's selfless commitment to the RNLI and Swanage Lifeboat Station. 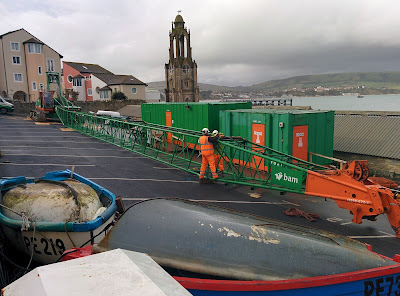 We wish him and his family all the very best for the future and look forward to seeing them from time to time when they venture back down South. 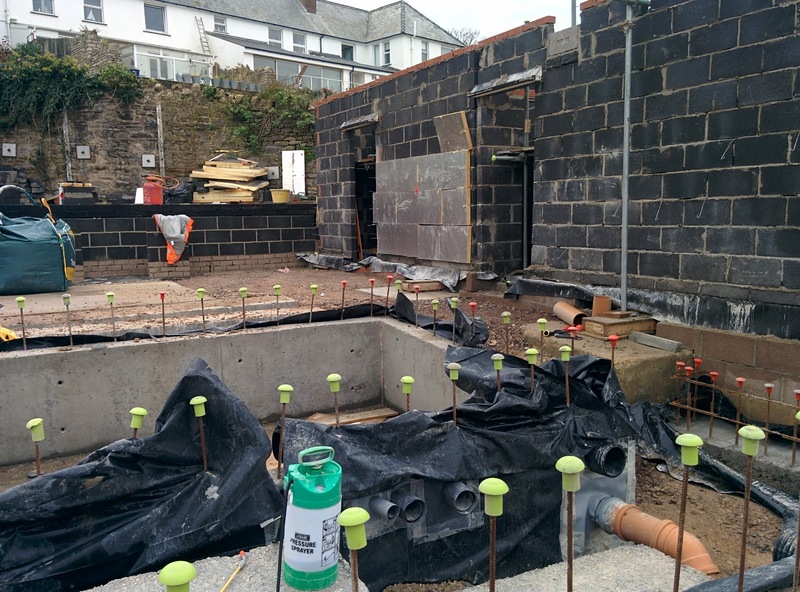 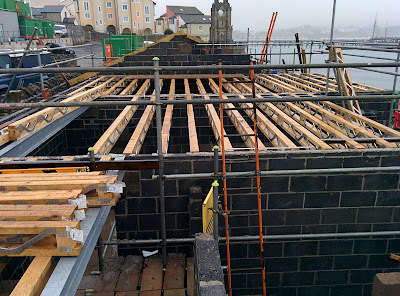 Boathouse update - floor slab nearly finished, more walls going up. Good progress again this week. 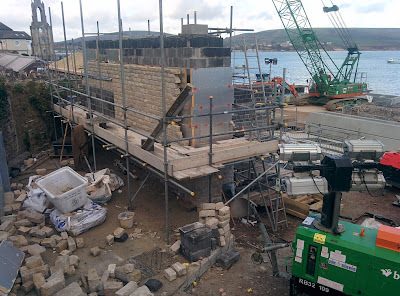 The back wall of the ALB boathall is coming on nicely. The main floor slab in the ALB boathall is pretty much done and provides a good flat area to store more of the precast slipway piers. 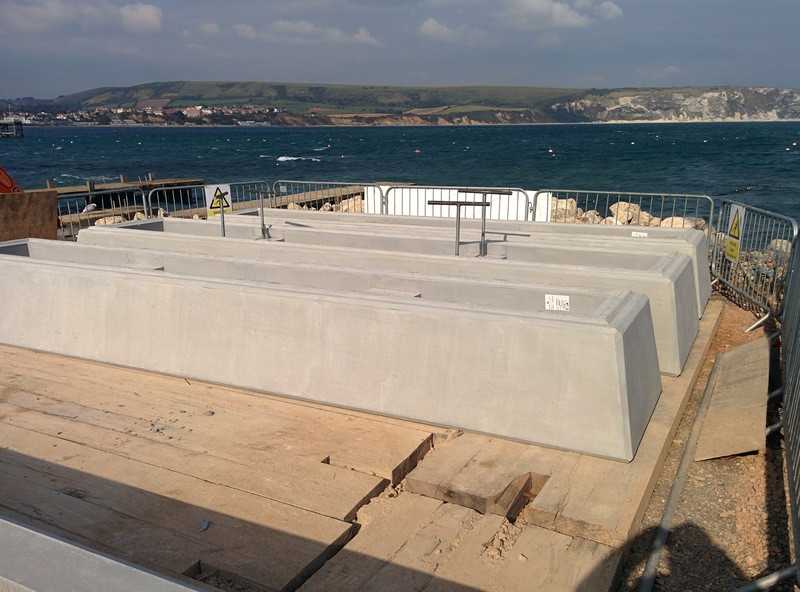 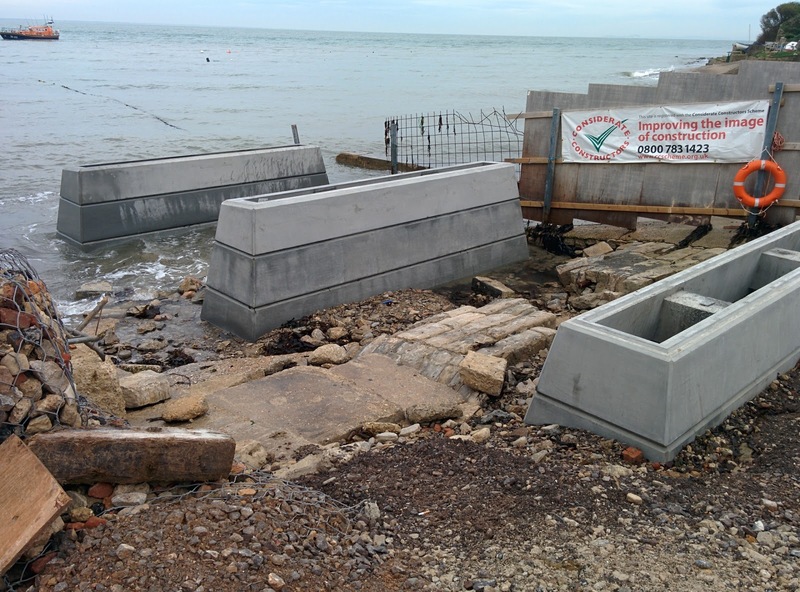 The first four slipway piers are now in place, they will be filled with concrete once the metalwork to support the slipway arrives. The green object beyond the fourth pier is a trench box and this is where pier five will be going. 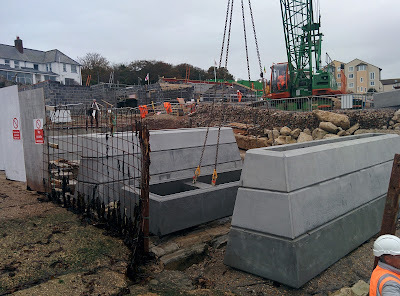 The other precast piers are just there for storage at the moment. 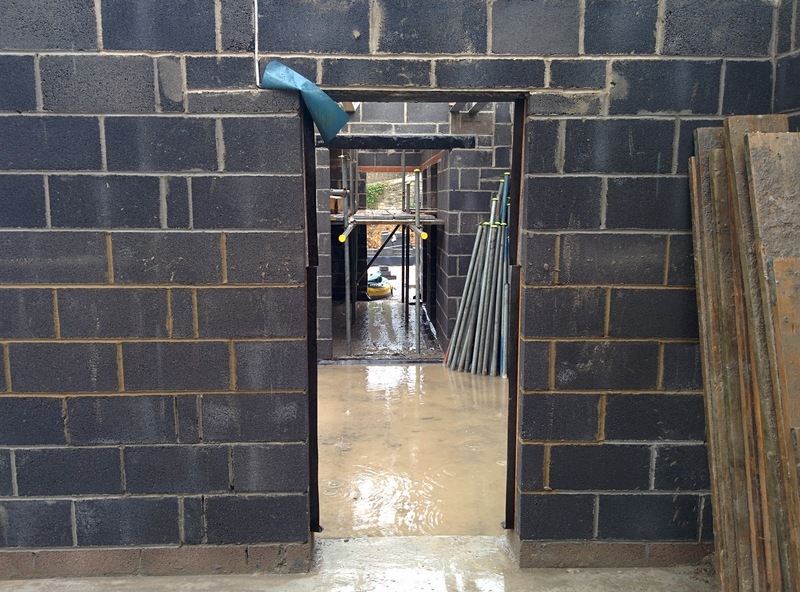 Another wet few weeks but the builders have been getting on with things. 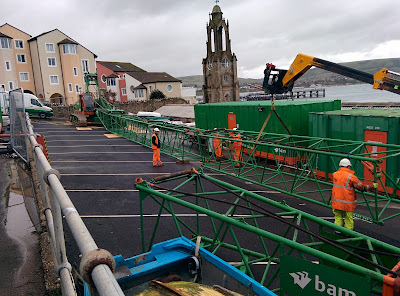 Most of the effort has been concentrated on getting the floor of the ALB boathall poured. This means bringing the block work up to above ground level. 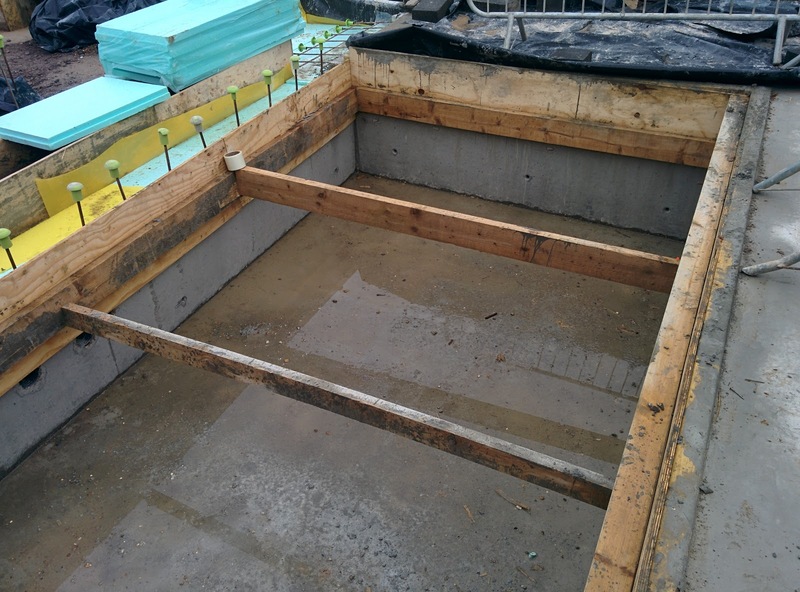 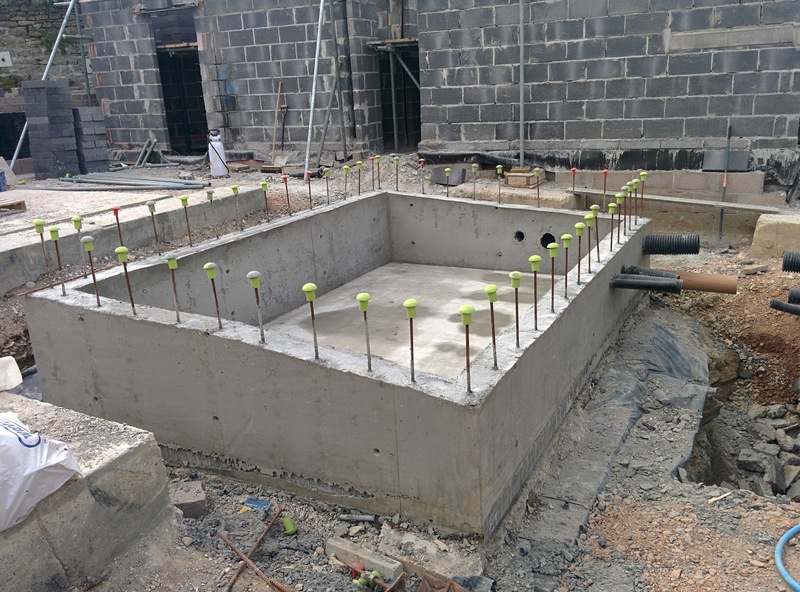 Then creating shuttering around the pits in the floor for the washdown water tanks and pumps and the slipway piers. 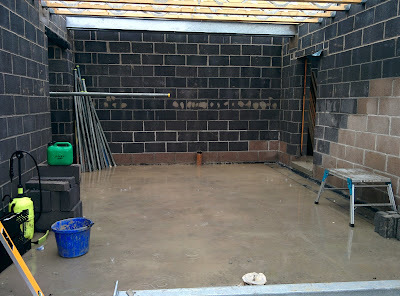 Unfortunately its virtually impossible to get a photo of the floor as its covered over to protect it. The Angling Club roof has come on a bit and the crew room floor has been fitted. The weather hasn't helped the builders this week. They were hoping to pour some concrete on Friday morning but that hasn't been possible. 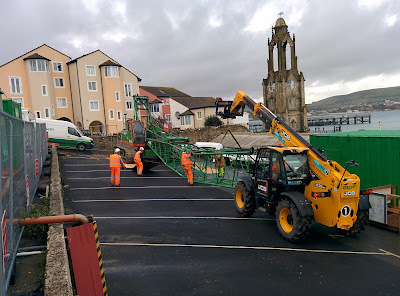 Despite the rain they have been busy though. 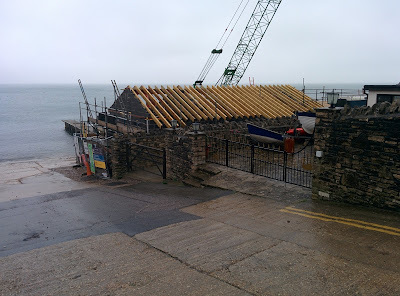 The roof of the Angling Club is starting to take shape. 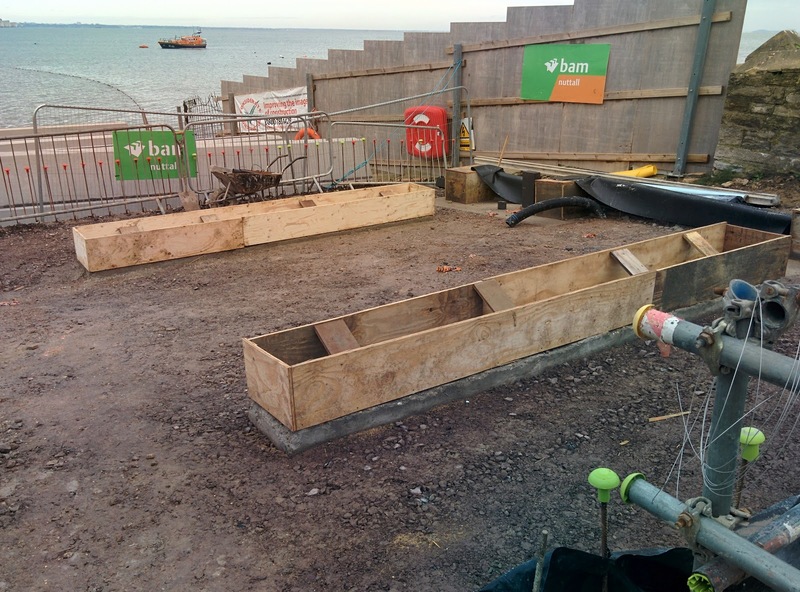 The ILB boathall has its ceiling joists and the steel beam to lift the boat to drain any water out of it. 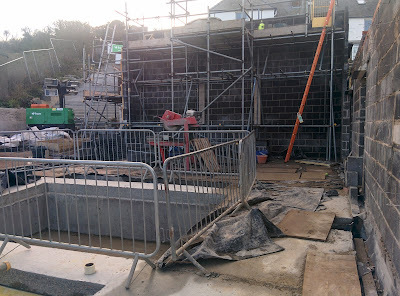 This is the doorway from the ILB shed to the changing room with the ALB boathall beyond that. 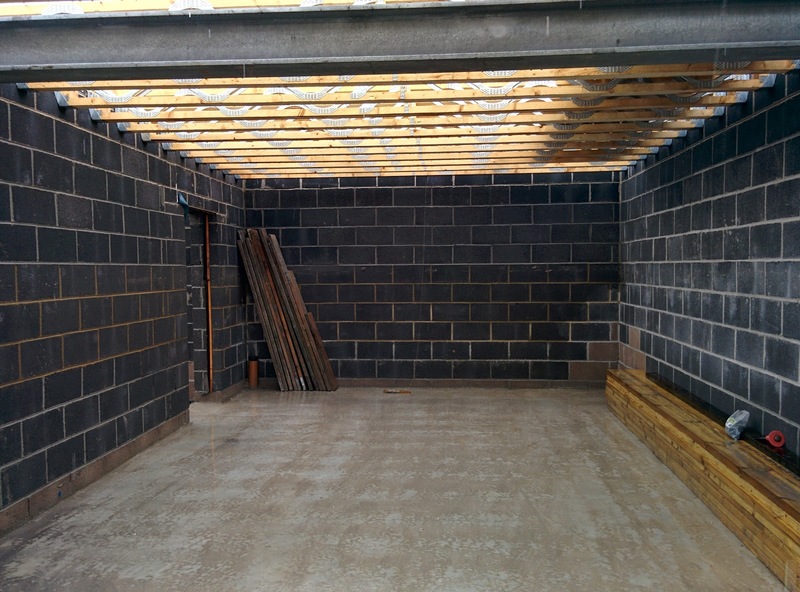 This is the changing room which now has ceiling joists and steel beams to take the weight of the wall above. 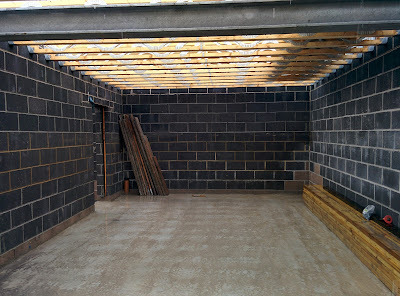 The floor isn't finished yet there's still the insulation and the underfloor heating to go in. This is the view from part way up the stairs looking towards the Angling Club. 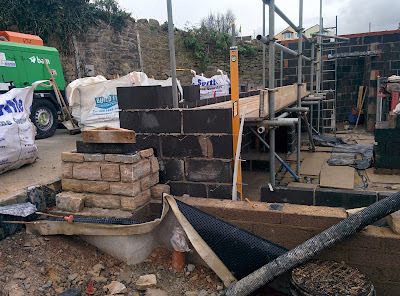 There's still another storey to go on here. 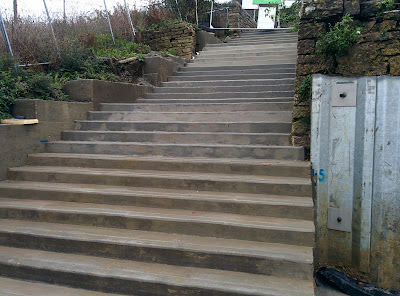 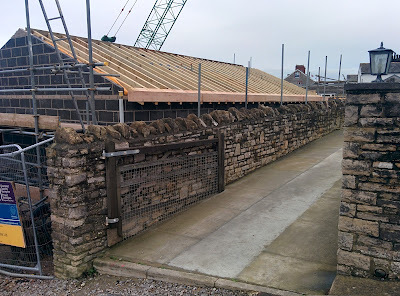 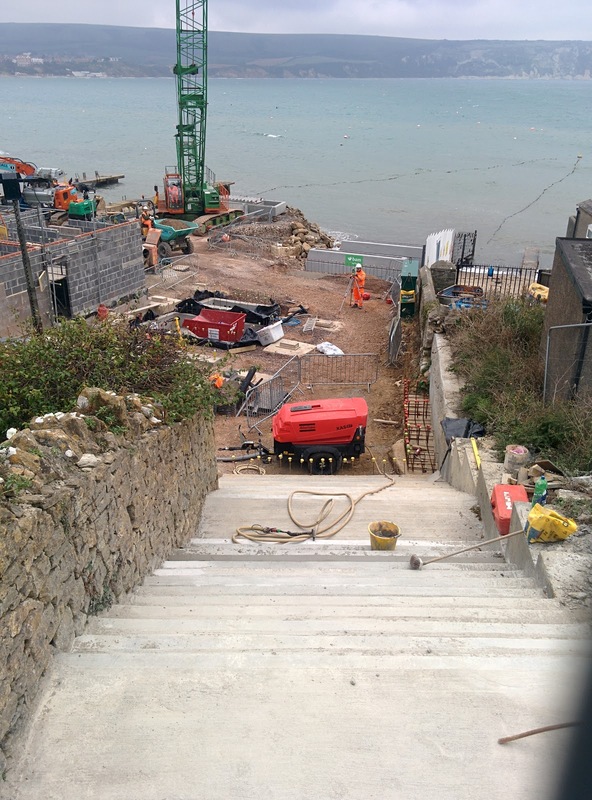 and the steps at the rear of the boathouse are structurally finished. Hopefully the weather will be a bit kinder next week so they can start on the ALB boathall floor. The future Shannon class Swanage Lifeboat has just completed its structural build at Berthon in Lymington and has undergone its first basic commissioning trials. 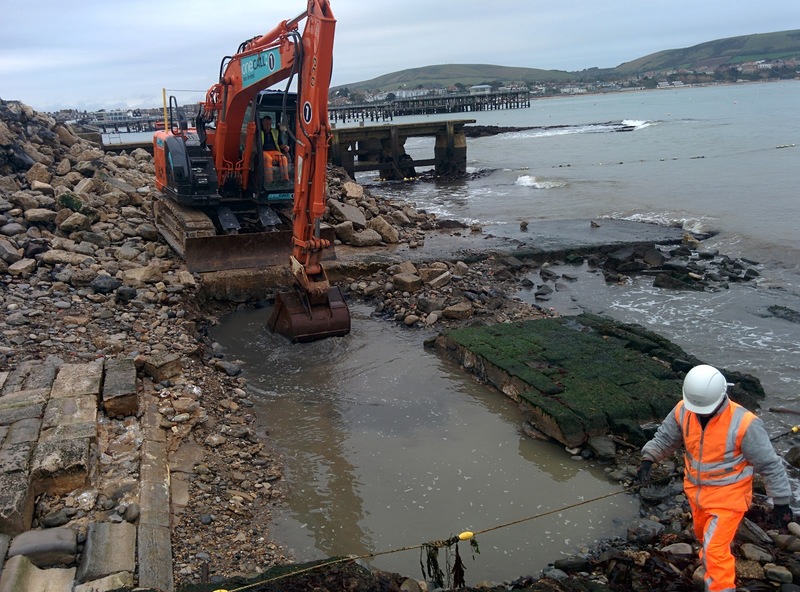 Station Mechanic, Dave Turnbull, went to see the boat on the momentous day that the George Thomas Lacy entered the water for the first time. 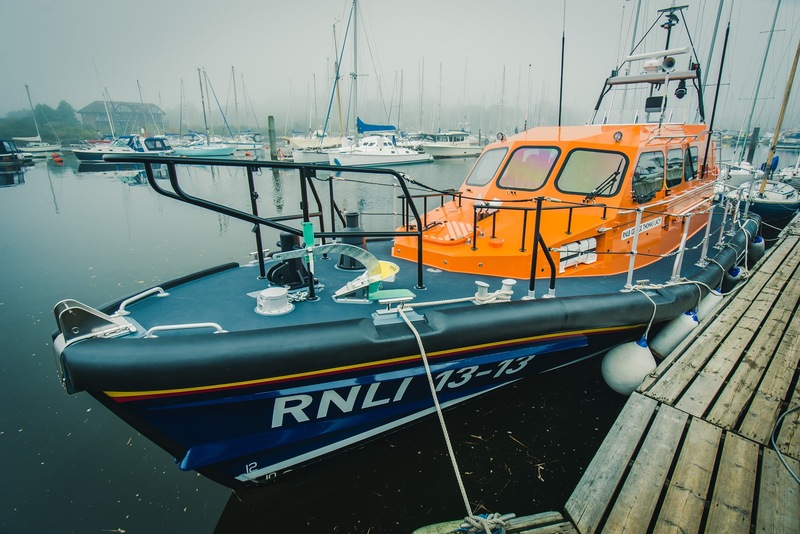 Dave said “It was amazing to be one of the first people aboard our future lifeboat, she looks fantastic and we cannot wait for her to arrive on station”. 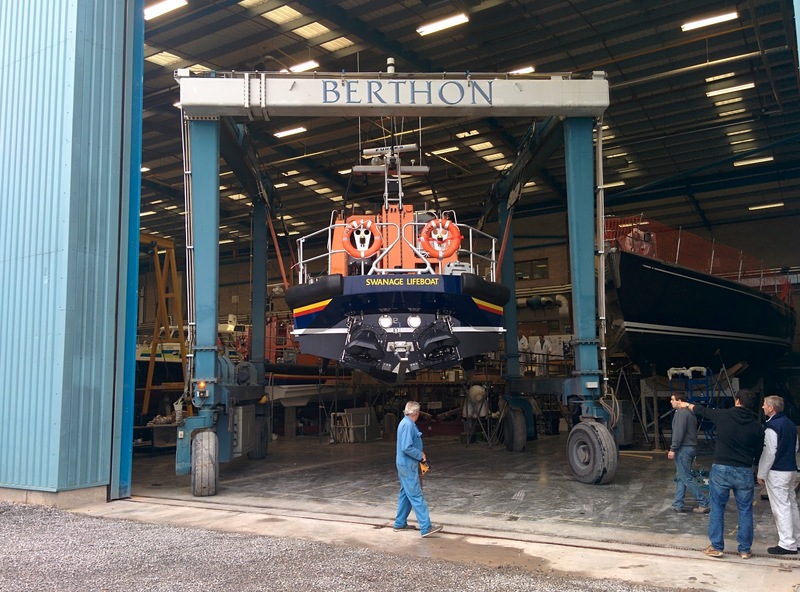 The future Swanage Lifeboat was carefully weighed before being lowered in to the water for the first time. 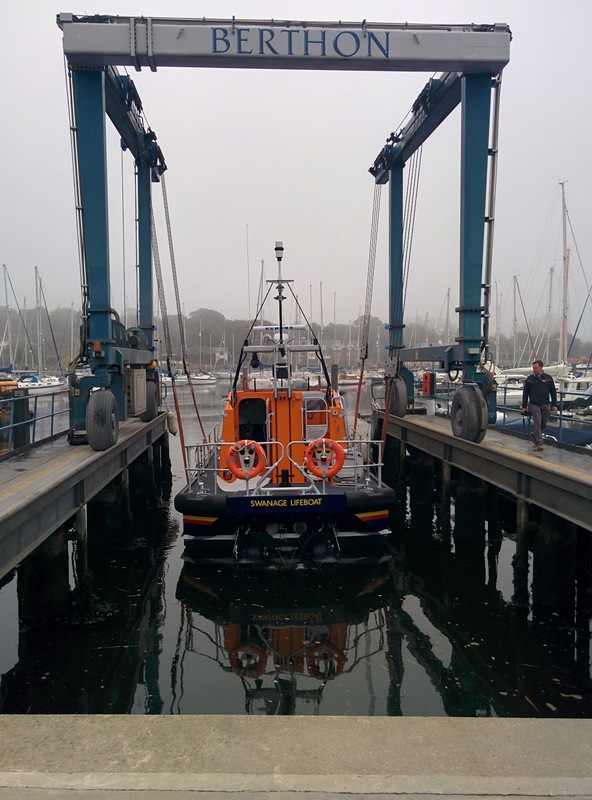 She then underwent some commissioning trials including stability checks and starting the engines for the first time. 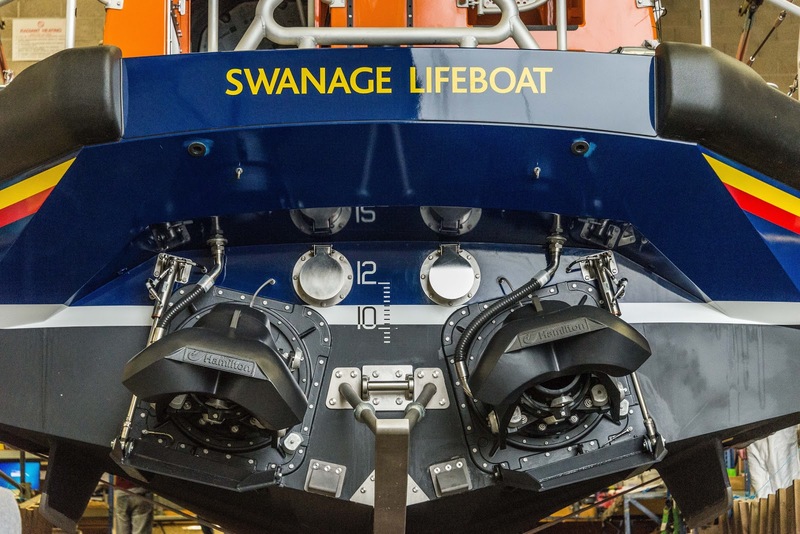 Over the coming weeks a series of further commissioning trials will be completed before the future Swanage lifeboat is ready to be handed over to enter the RNLI fleet, around the end of 2015. 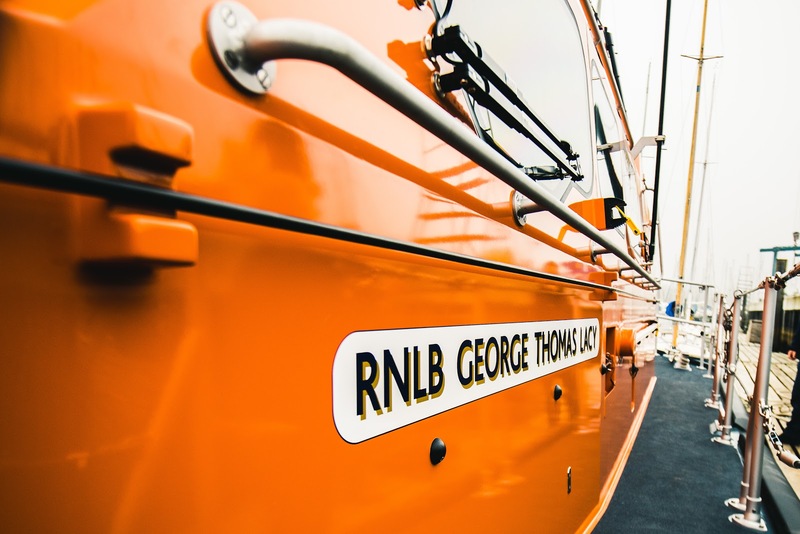 Once accepted by the RNLI the 'George Thomas Lacy' will commence a succession of sea trials to test every aspect of the boats capability. 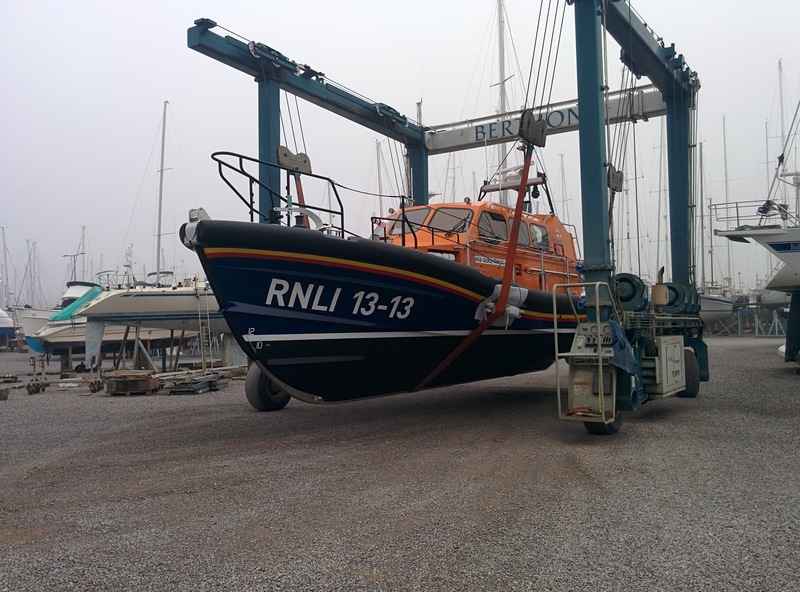 The Swanage crew will be undergoing training on the new lifeboat early next year, ready for the lifeboat coming on service in the Spring of 2016. BAM Nuttall have been taking advantage of the spring tides this week and getting on with more of the ALB slipway. 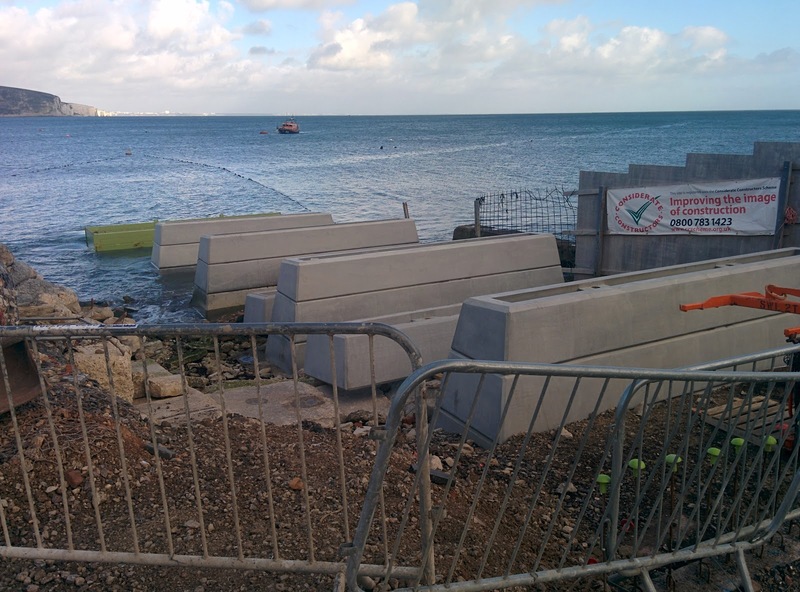 There are now 3 piers in place and hopefully they'll have the base of the 4th positioned by the end of today. The bottom segment is very carefully positioned to be level and at the right height. Once in place the base is filled with concrete. 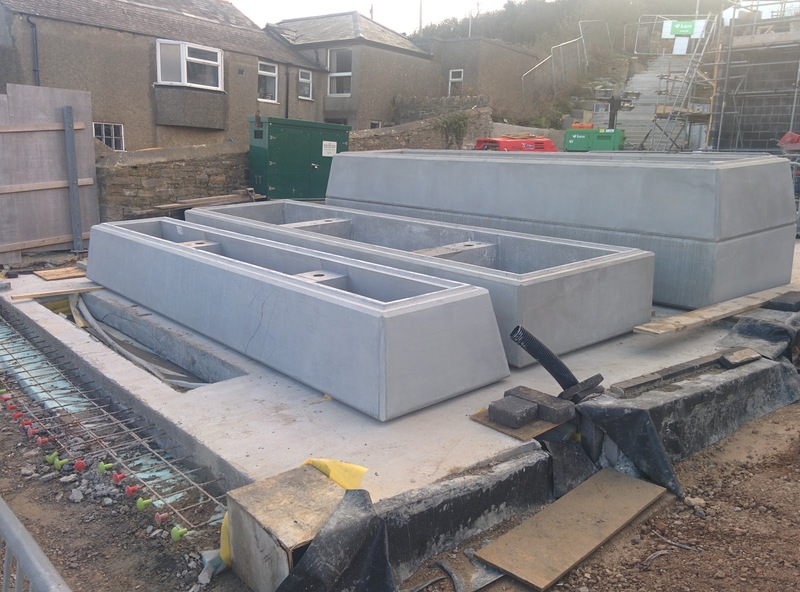 The other units are then stacked on top. The whole thing will be filled with concrete eventually but there's steelwork to support the slipway to be added first. 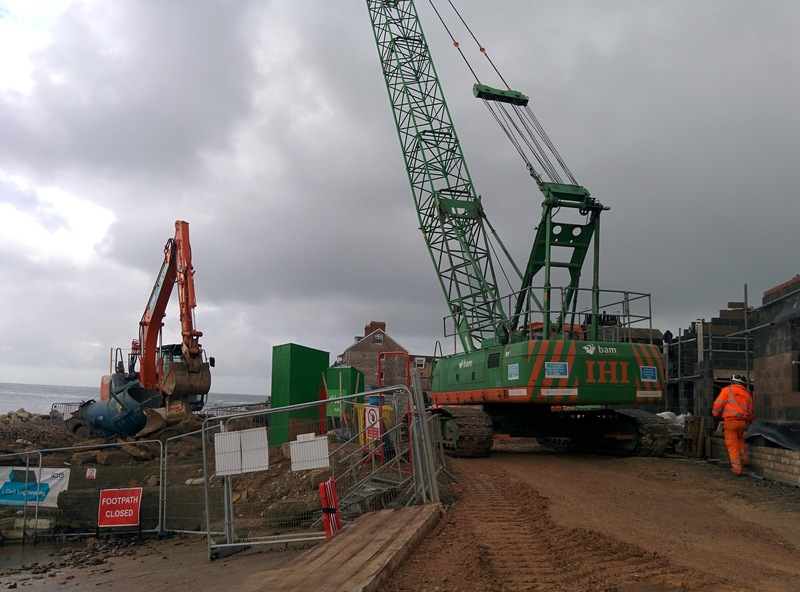 This is the hole for the 4th pier which hopefully will be in position by the end of today. 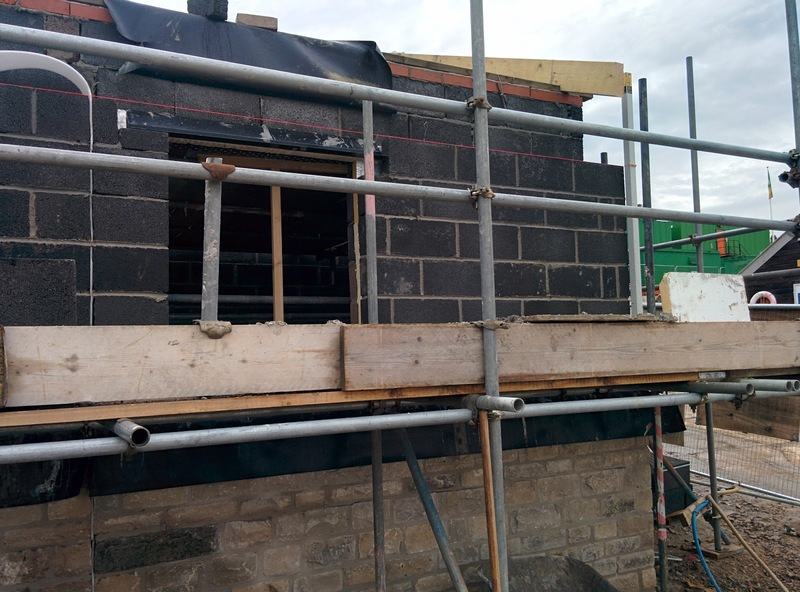 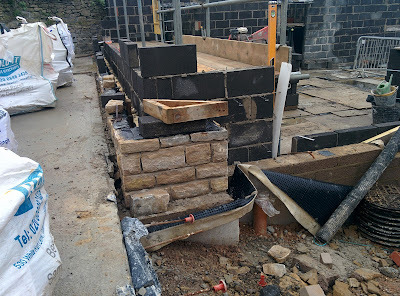 The brick layers have been busy building up the outer skin on the Angling Club. 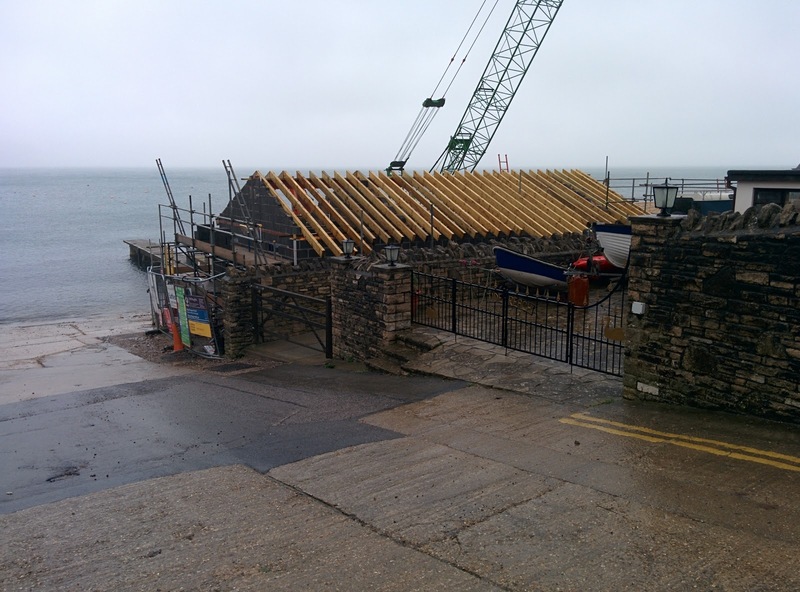 The joists above the ILB boathall have been fitted, hopefully next week the ones above the changing room will go in too. 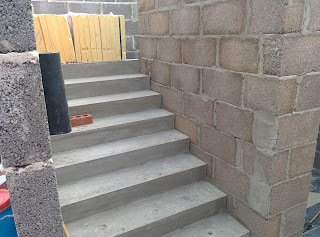 The rear steps are just about finished but there's still the Eastern wall to rebuild. The inside of the ALB boathall is coming on too, hopefully the floor slab will be cast in a few weeks. 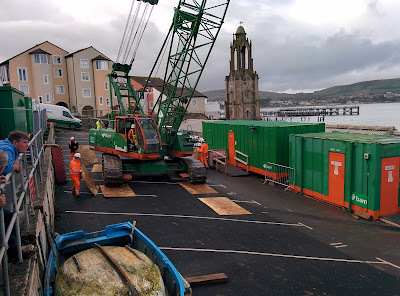 Lots of things have been happening since the crane arrived on site. 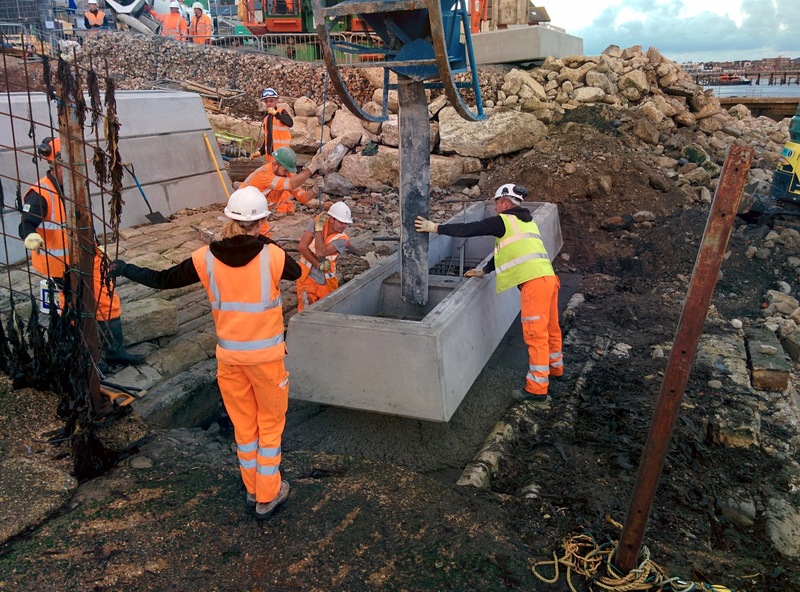 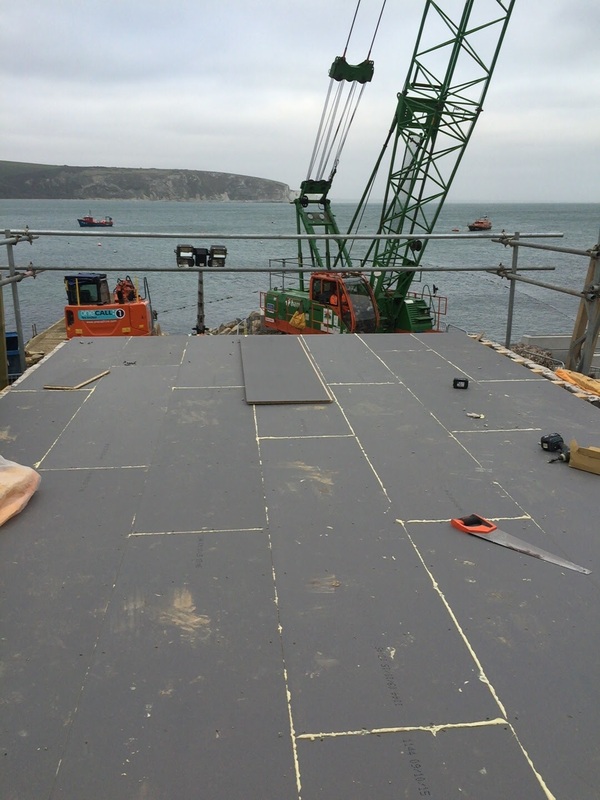 The first of the precast concrete slipway piers has been lowered into position. 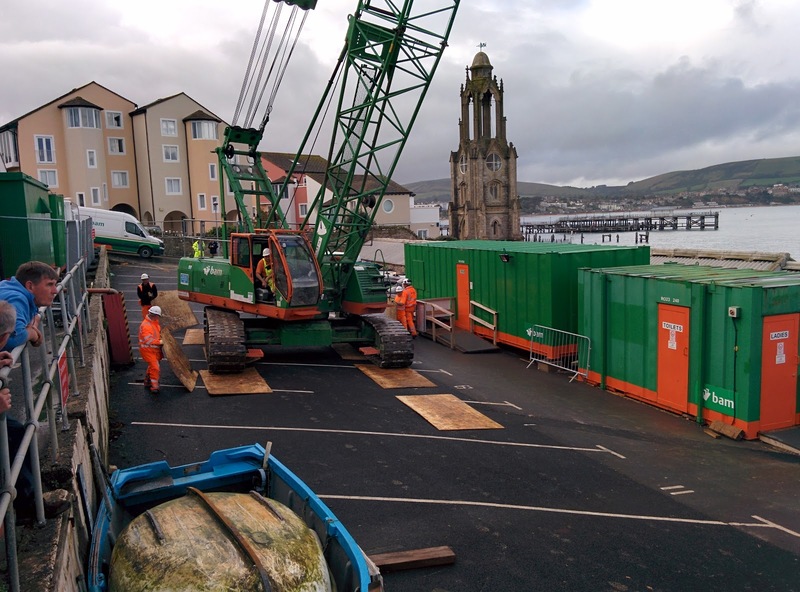 Each one weighs over 5 tons! 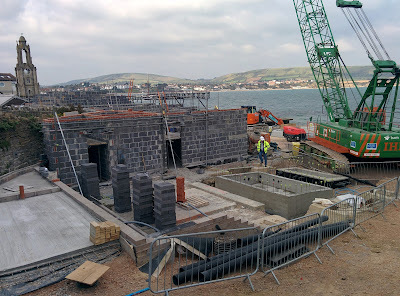 These will stack up to form pier 2, the top of pier 1 is just in shot bottom left. 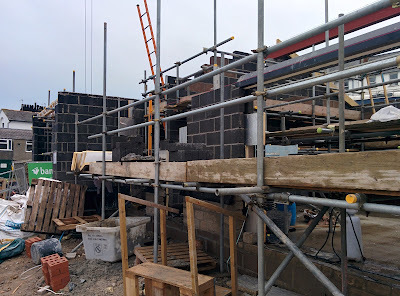 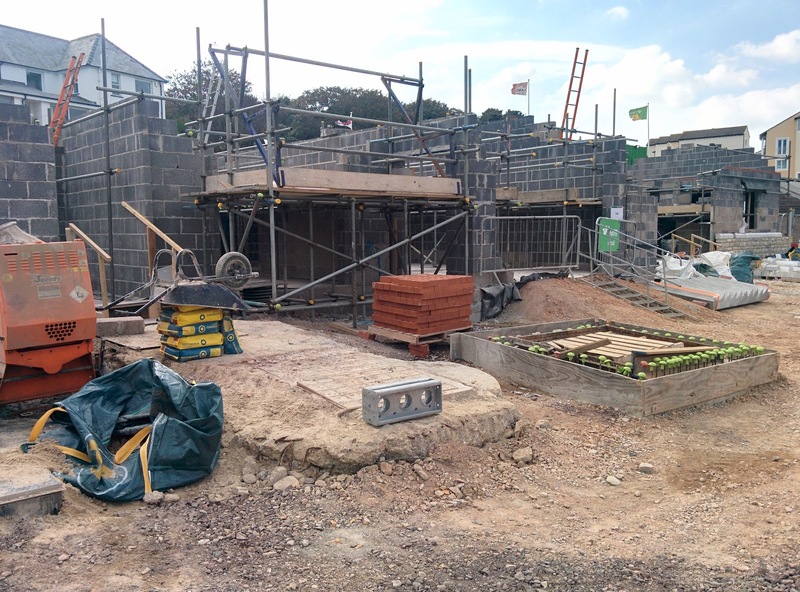 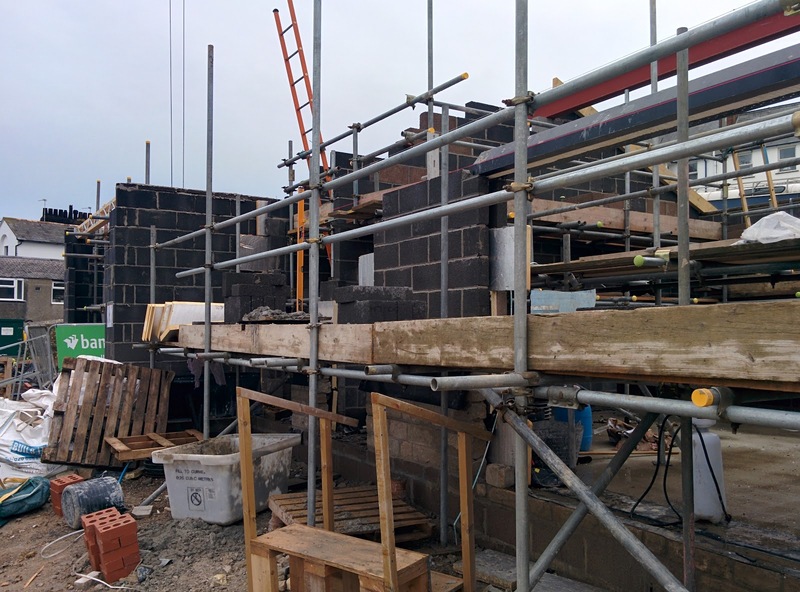 The block work is up to first floor for most of the building. 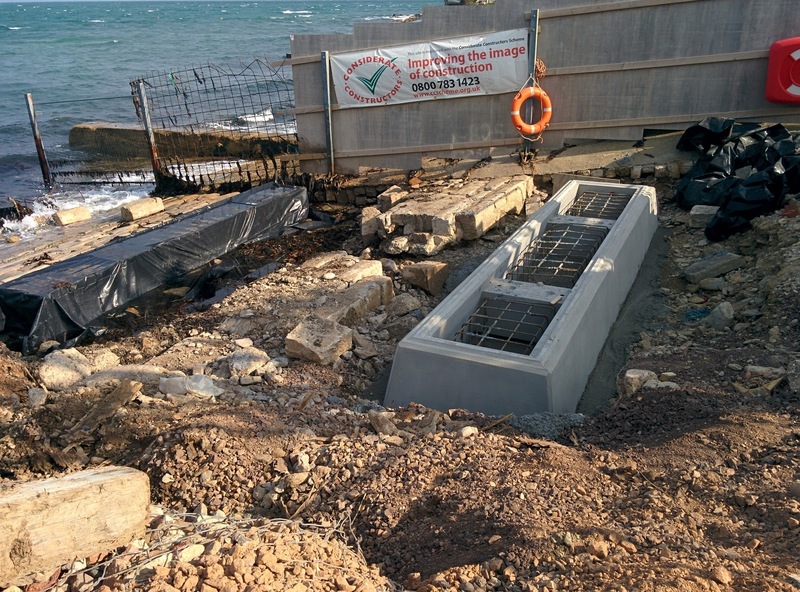 The pit for the water tanks for boat washdown and slipway lubrication has been cast. 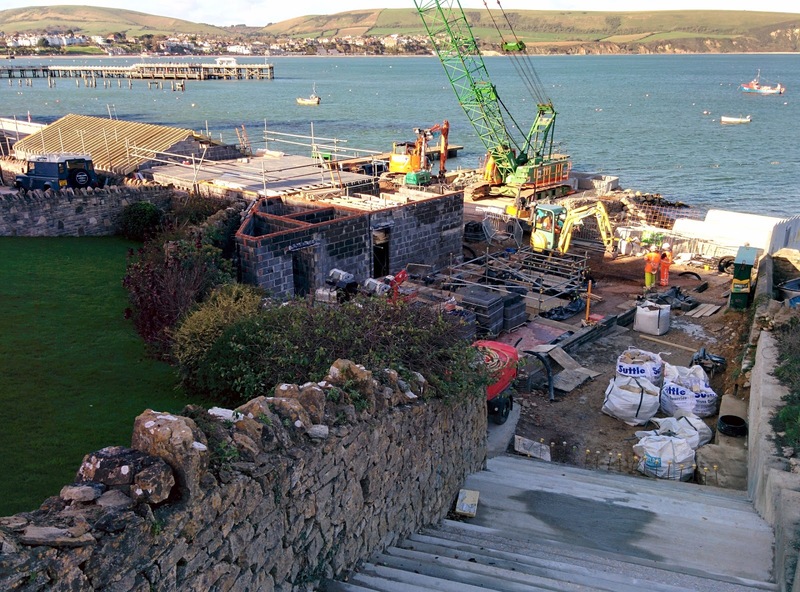 This is the view looking back towards the changing room and the ILB boathall. The angling club is taking shape on the far right. 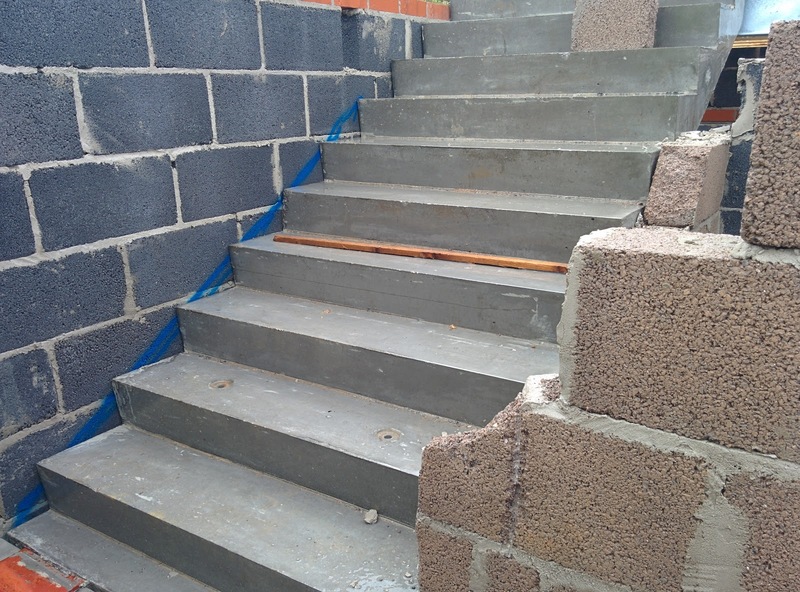 These precast steps will take the crew and visitors up to the first floor eventually. 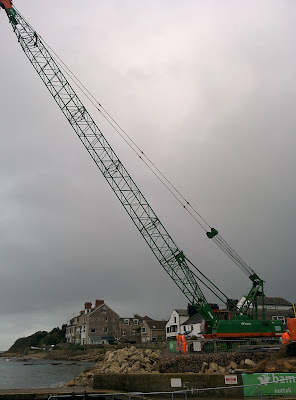 They were one of the first jobs for the crane. 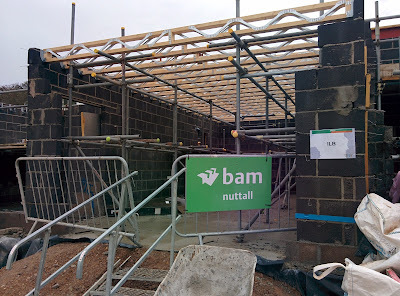 Expect more progress next week! 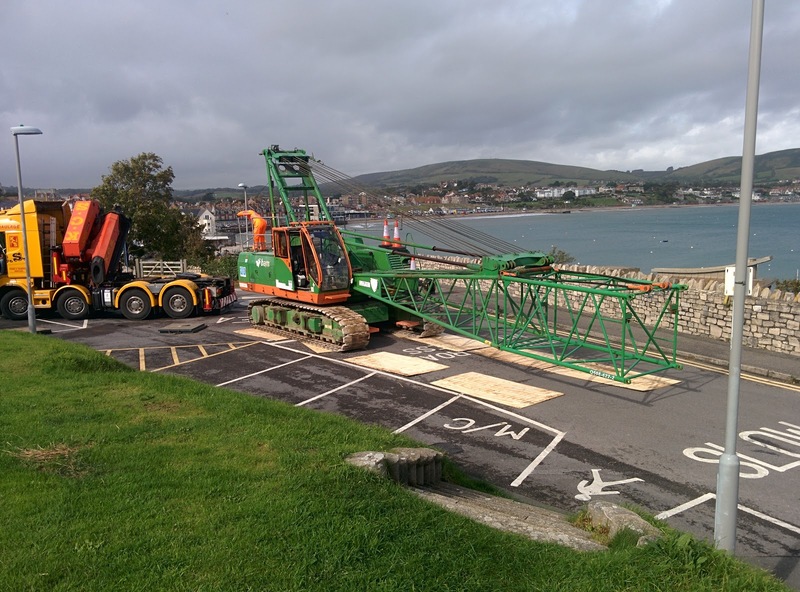 Sorry to those caught up in the traffic as our site crane was delivered this morning. Its now in place on the site and will be put to work very soon. 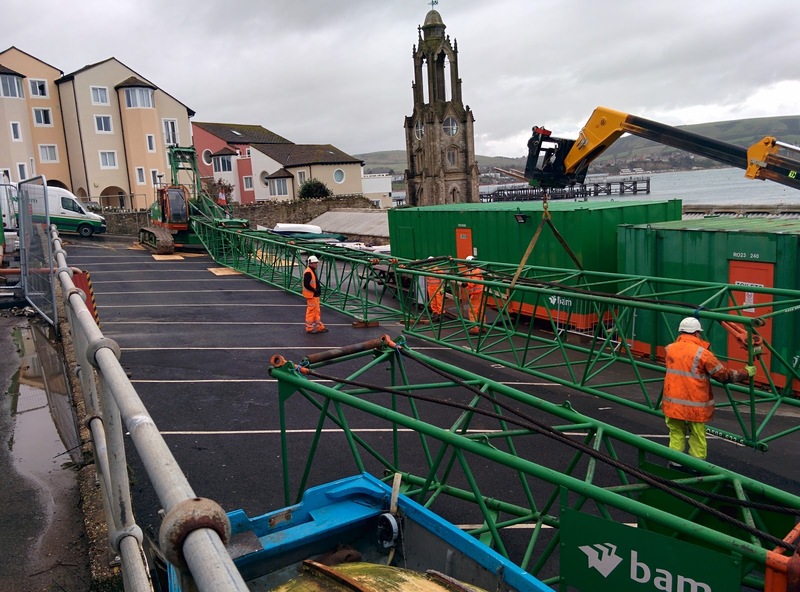 The crane came in parts and was assembled in Broad Road car park (thanks Swanage Town Council) and the boatpark. and then tracked on to the site.